Any velvet piece of clothes looks very expensive and gorgeous, so I’m sure you need to have at least one. 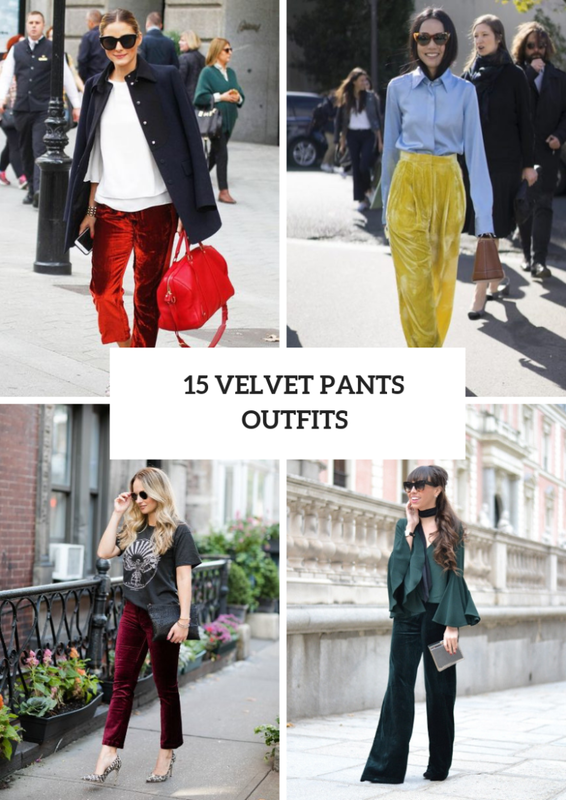 For example, you can pay an attention to velvet pants which will be good for spring outfits. 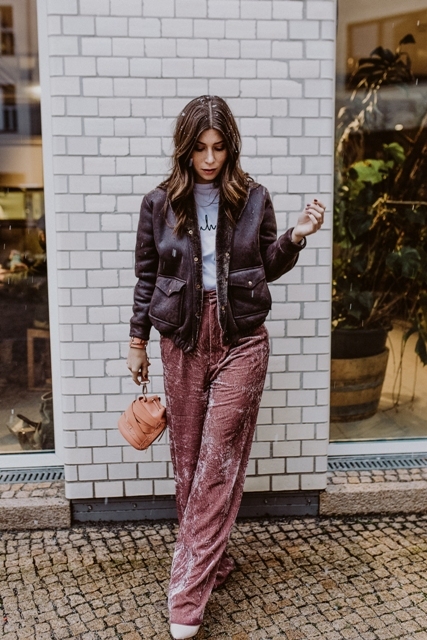 There are a lot of various stylish velvet trousers, so depending on your whole style and wishes you can choose from chic skinny to relaxed wide leg, from trendy cropped to classic straight ones. And, of course, you are free to pick up a color for your new item from basic black and navy blue to eye-catching burnt orange, yellow or red. Scroll down to see ideas and get inspired! 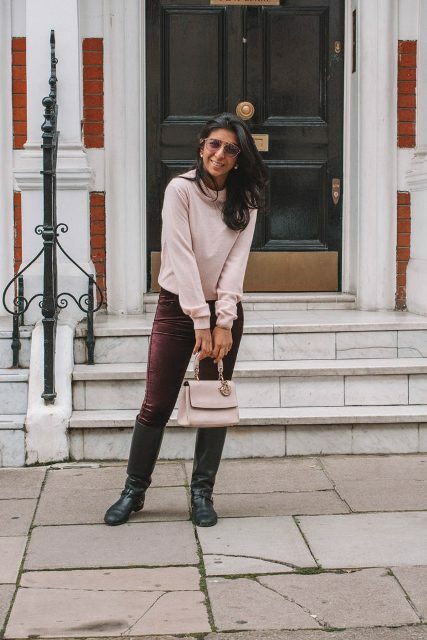 If you wanna something elegant for everyday looks, then you can take a white and black printed sweatshirt and combine it with sunglasses, marsala velvet skinny pants and black lace up high heels. Or you can choose a light blue button down shirt with long sleeves and pair it with oversized sunglasses, a brown leather mini bag, yellow velvet high-waisted wide leg trousers and yellow shoes. One more cool idea is to mix a labeled t-shirt with marsala straight pants, a black leather clutch and leopard pumps. 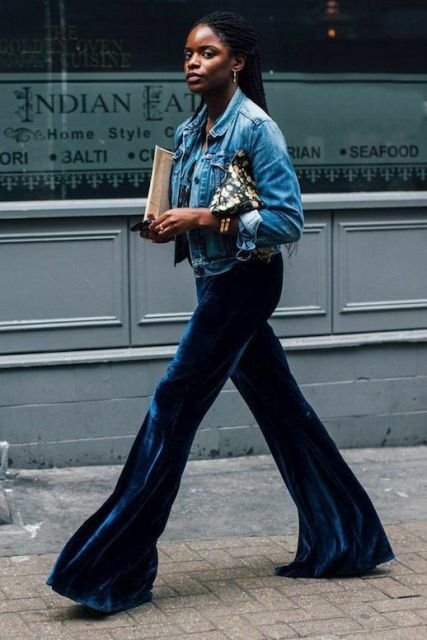 For creating a casual outfit you can try to repeat a combination with a top, a denim crop jacket, a floral clutch, navy blue velvet flare trousers and high heels. Or you can take a white loose blouse and pair it with red velvet cropped pants, animal printed flat shoes, a red big bag and a navy blue coat. Wanna make an awesome look for a party? Then take a gray t-shirt and combine it with a glitter blazer, navy blue velvet jogger pants, a black leather bag and black pumps. For more ideas look below.